Create last minute Valentines for friends, coworkers, and classmates with this Free Valentine Printable. Easy DIY craft tutorial idea. Valentine’s Day is tomorrow, but if you are a last minuter like me you still have plenty of time, especially if you use this free Valentine printable! A couple of weeks ago I pinned the cutest free Printables from eighteen25. They are called Quick & Cheesy Hubby Valentines. The saying that went along with a bag of chips was my favorite. Especially since my plan was to give these to girls and guys. Plus my boss is a guy and that might be awkward to give him a Valentine that says you are my stud-muffin. Maybe that is why eighteen25 said they were for your hubby. But I like to break the rules. Anyways, last night I made about 15 of these cute little guys and it took me about 30 minutes. Since eighteen25 provides the free printable, it was so easy! 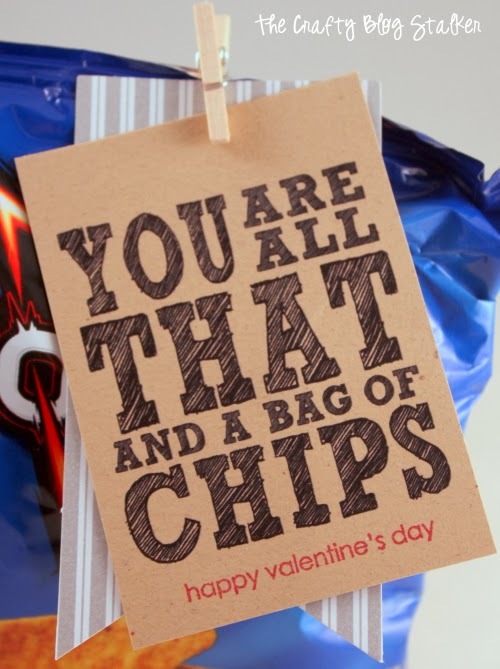 I stamped my valentine greeting underneath, made several tags with some scrap pattern paper, and attached to a single bag of chips with an itty bitty clothes pin. Ta-Da! A way cute Valentine that won’t look like you waited until last minute (even though you totally did!). 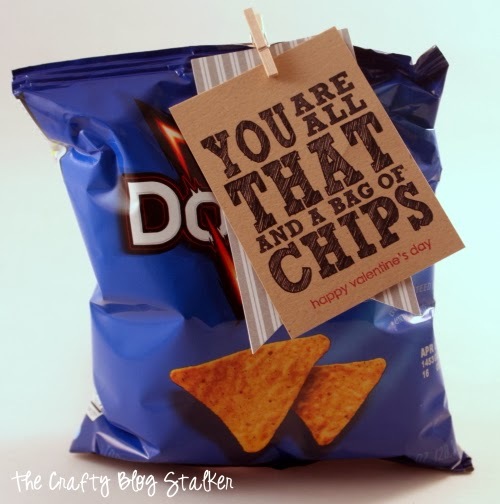 Visit Quick & Cheesy Hubby Valentines to print your own! SAVE LAST MINUTE VALENTINE PRINTABLE TO YOUR FAVORITE BREAD RECIPES PINTEREST BOARD! Totally adorable!!! Thank you for linking to the Weekend re-Treat link party! This is an adorable idea! And it’s easy, I love when something is adorable and it’s easy! These are so cute, love the bag of chips! Thanks for sharing them with us at Sewlicious Home Decor! Pinned! how can I print this printable? Ashley, there is a link at the top of the post that directs you to the blog Eighteen25. (http://eighteen25.blogspot.com/2014/02/quick-cheesy-hubby-valentines.html) It is actually their printable. I am so glad you like it! !